two peas & the dog: food. 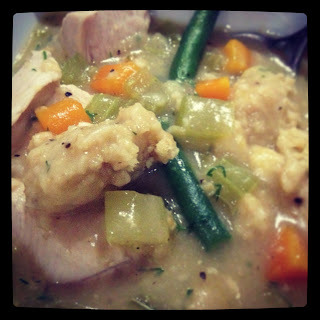 hearty chicken and dumpling soup. First thought: best homemade chicken soup we've ever had. Thanks Food Network, it was delicious. Heat the olive oil in a medium Dutch oven over medium-high heat. Add the celery, carrots, garlic, onions and cook, stirring, until the vegetables are softened, 5 minutes. Add the broth and bring to a simmer. Cook, stirring occasionally, until the vegetables are tender, about 15 minutes. Meanwhile, grind the oats in a food processor until fine. Combine with the flour, baking powder, zest, 1/4 teaspoon salt and 1/4 teaspoon pepper in a medium bowl. Work in the butter with your fingers until only very small pieces remain. Stir in 1/2 cup ice water, a bit at a time, until a soft dough is formed. Let rest 10 minutes. Drop cherry-size bits of the dumpling dough into the soup. Add the green beans and stir gently. Cook, stirring occasionally, until the dumplings are floating and cooked through and the beans are bright green and crisp-tender, about 12 minutes. Add the chicken and continue to cook until it is just cooked through, about 3 minutes. Remove from the heat, stir in the dill and season with salt and pepper.